Resa djupt in i Andesfjällen på en hel dagstur till Sewell Mining Town från Santiago. Efter att ha åkt genom bergslandskap, kommer du att gå in på en guidad vandringstur i UNESCOs världsarvslista. Lyssna på kommentarer som beskriver stadens kulturella, arkitektoniska och historiska betydelse och se framträdande sevärdheter som Morgan Square och Teniente Club. Få en intressant översikt över El Tenientes kopparmruva och återuppliva med lunch på en lokal landklubb. På denna lilla gruppresa - begränsad till 15 personer - får du personlig uppmärksamhet från din guide. A worthwhile tour that shows Chiles copper industry past and present. We not only saw the camp, but the whole surface operation of the mine. It was so much more than we had anticipated. The history and scenery make this a must. A great day in the cold of Sewell. Most interesting past and present. My only problem was that for the first part of the tour being the only English speaker I was given the English commentary in private but hearing my guide over the loudspeaker delivery of the Spanish guide was disconcerting. We soon put that right and all went well from then on. 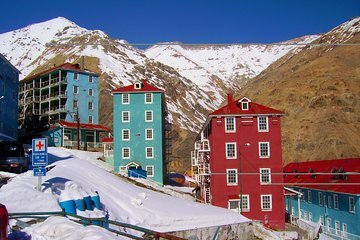 An amazing historical site that shows the golden age of the mining industry in Chile! We were picked up on time at Baquedan Square, our tour guide Marco was very professional and spoke fluent English, included lunch was absolutely delicious and the whole tour was just perfectly arranged! This tour was great. Tour bus was comfortable. The tour guide is an experienced worker who provides information in English and Spanish. Awe inspiring and historic as well as breathtaking.